Destinations — Float Eureka: Choose your adventure. Known as the “Little Buffalo,” the bluffs and scenery on this stretch of War Eagle Creek can’t be beat. 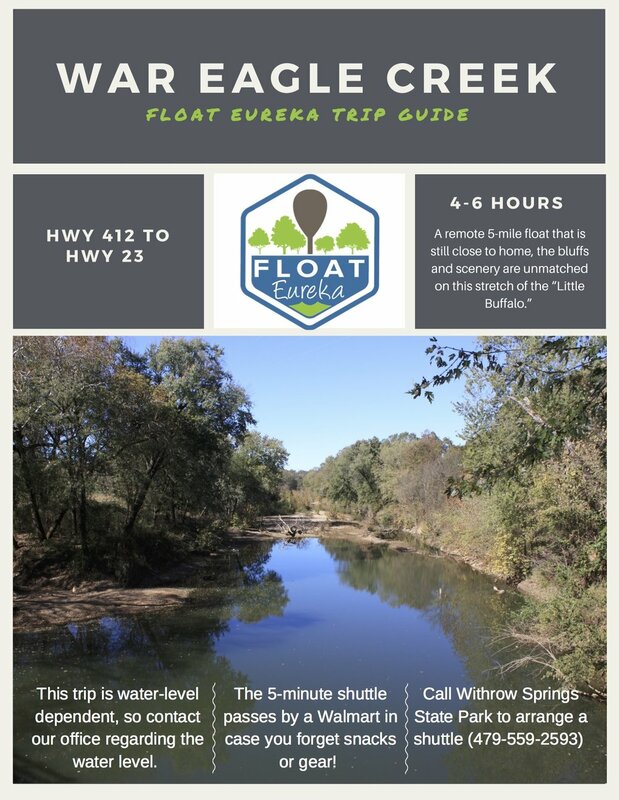 There may be no better combination of beautiful wilderness and convenience to Eureka Springs, so plan to spend an entire day on this great float. The shuttle only takes 5 minutes and passes by a Walmart in case you forgot the snacks or your fishing pole. This trip is water-level dependent, and more likely to be higher in the spring than late summer, so ask our staff if the water level is appropriate. Withrow Springs State Park offers a shuttle service, just call 479-559-2593. Check out the photos below for a preview of this location!